Kit of 4 x 6-inch tri-blade propellers - 2 white and 2 black These plastic propellers were designed for the Parrot Bebop 2. They have been designed to minimise power consumption from the motors while providing maximum thrust. 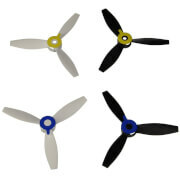 2 types of propellers are provided: clockwise propellers and anti-clockwise propellers. In order to facilitate the fitting of the propellers, a patented mistake-proof system is used to immediately identify their location.